British operator bitcoin wallet and debit card Wirex launches in Europe cryptocurrency debit cards. The new product offers support for multi-currency accounts in British pounds, euros, us dollars and bitcoin. Earlier this week, community Manager Wirex Rafael Shalabi confirmed successful completion of internal and external beta testing of the product. According to him, is expected to issue three types of cards: virtual, plastic and pre-paid contactless. As of March 8, the new VISA is already available to customers Wirex from the UK, and by the end of the month that they are available to residents and other EU countries, this mission is the company’s priority. We will remind that on January 4 this year, the international payment system VISA sent to the issuing Bank WaveCrest, based in Gibraltar, the order to immediately close all of its issued debit cards. According to a statement by VISA, the reason for the decision was the systematic failure to comply with the requirements of the company from WaveCrest. The largest venture company in South Korea Korea Investment Partners (KIP) invested in the first startup from the scope of the blockchain industry. A new investment partner KIP was the company Temco bent on using blockchain technology to transform the management system of supply chains for small and medium enterprises. The amount of the company’s investments is not called. “Temco is more than ready to breakthrough in the existing process supply chains. Temco not only superior to existing business solutions and is a shining example of the potential of blockchain technology,” said Council member KIP of investment in FINTECH Jong Hyun Kim (Jong Hyun Kim). Founded in 1986, the venture capital firm has invested in more than 500 companies, including major Korean projects, such as Naver, the leading Internet search engine in the country, and Kakao, the operator is dominant in the Korean messenger Kakao Talk. Earlier, the South Korean government has decided next year to double the funding of the projects scope blockchain. The country is still prohibited the holding of ICO, and the authorities are wary of cryptocurrency trading. Thus the Governor of the island province of Jeju appealed to the Central government to make the region a special area for the development of blockchain and cryptocurrency. The received means will go on development of the platform Crypto Libra Office and other products of the company, strengthening the team and expanding client base. In addition, funding will focus on expanding market through cooperation with custodial companies, miners and services lending. As the head and founder Jake Benson (Jake Benson), the mission of Libra is to provide a recording system data that allows companies engaged in transactions with cryptocurrencies, to meet the demands of managers, investors, auditors and regulators. Recall that in the fall of 2017 Libra startup has raised $7.8 million investment under the financing series A. The largest venture capital firms interested in participating in ICO Telegram. About his desire to invest in the development of multi-blockchain platform TON said Sequoia Capital, Benchmark Capital and Kleiner Perkins Caufield & Byers. 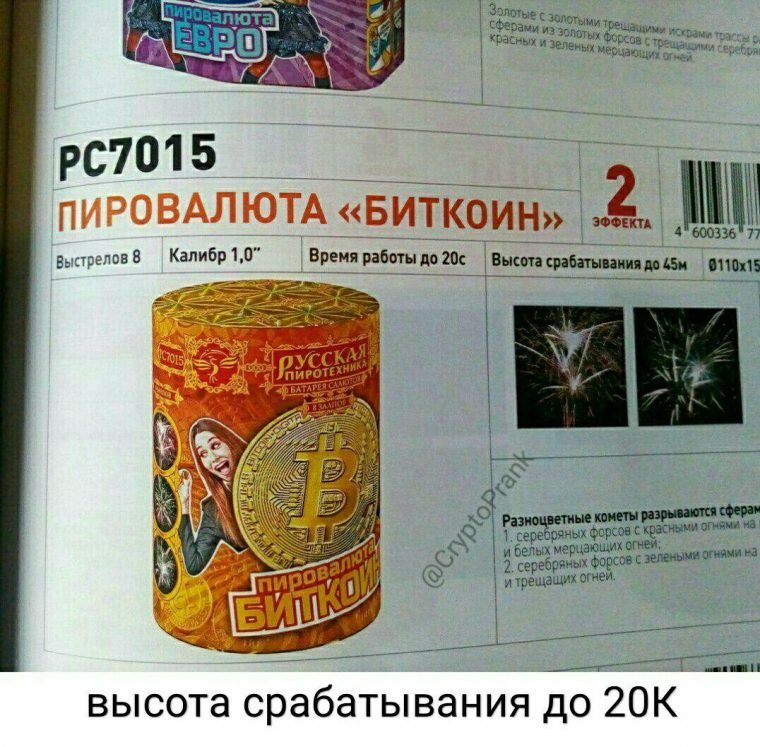 At the same time, specialized cryptocurrency funds from this opportunity deliberately refuse. Charles Noyes (Charles Noyes) of the company Pantera Capital involved in bitcoin investments in 2013, reported that the proposal platform TON does not seem so interesting. Excessive demand for this ICO suggests that the sector is overheated because of the draft white paper contains very little convincing specifics. Bart Stevens (Bart Stephens), managing partner of Blockchain Capital, and abandon investment in ICO Telegram, says that investors who missed the cryptocurrency boom last year, the offer Telegram seems very best, some chance to catch up. With the experts fully agree and managing the cryptocurrency Fund Solidus Capital Carlos Mosquera (Mosquera Carlos). He also believes that this ICO is too overrated, so refused to participate. According to him, many market participants enter into ridiculous trades today, acquiring tokens, just in case, like chips in a casino. «This is the largest ICO, attracting big investors, but I believe that the implementation of the project requires deep technical knowledge and expert knowledge in cryptoamnesia, mechanisms of consensus, and scalability, they do not have». While about cryptocurrency write a popular media – first because of their rapid growth, and then the fall – out of all information sources in social networks of potential investors prefer YouTube. This is evidenced by the findings of the study BDCenter. Videohostinga service by a wide margin superior to such popular among cryptocurrency traders platforms for communication, like Twitter and Reddit. This is probably due to a preference for referral links as a way to monetize video content by its authors. The study also BDCenter provides data on traffic sources various trading platforms. Exchange Binance, for example, 80% rely on direct referrals, and only 2% of its traffic are provided in different types of paid promotion. 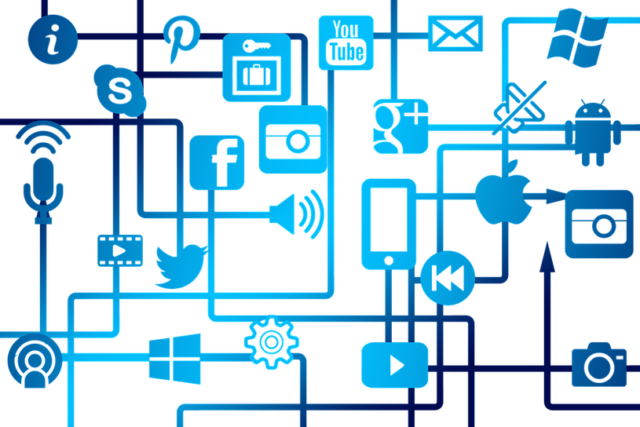 While in social networks it your ads not to place. Exchange OKEx gets 74% of traffic from direct navigation and less than 2% from advertising. 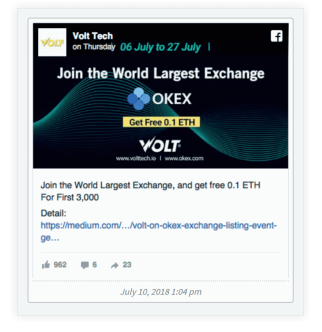 OKEx promotion in social networks engaged its partners, such as Volt Tech. If you examine the Huobi traffic from search engines, it turns out that 99% is organic search in Baidu the Chinese system. 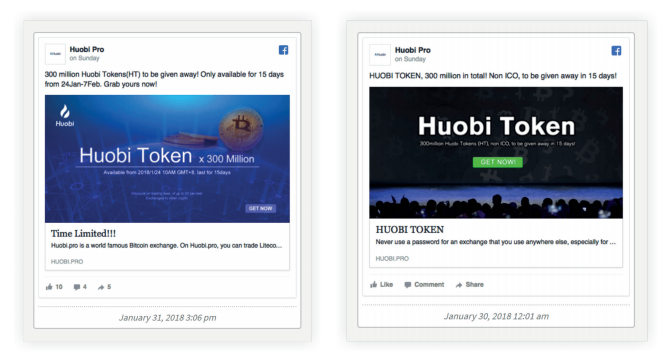 About one-third of Huobi traffic comes from social networks. The exchange is actively promoting not only their services but also their own token. Bitfinex gets the lion’s share of traffic from Google search and direct transitions over 99%. In this ad accounts for only 0,03%. The American stock exchange Coinbase relies on direct referrals and referral links, but 2% ad traffic in her case correspond to 100 000 unique users. 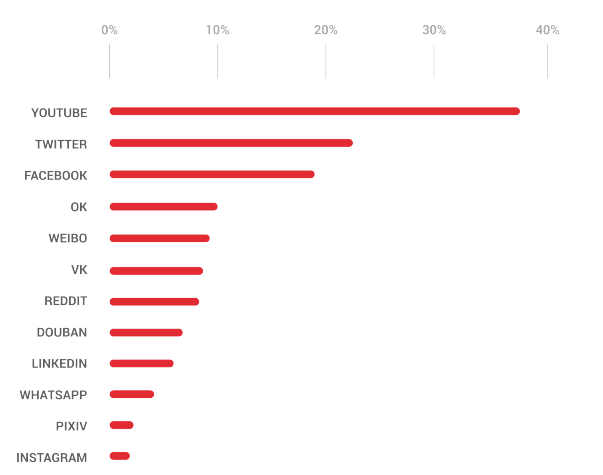 Exchange Bittrex was popular in social networks – 11%, of which 80% is YouTube and Facebook. Poloniex makes it even more serious emphasis on the social network, with over 1 million monthly users and 2 million users with search traffic. Earlier, netizens speculated that the popular service for tracking market behavior CoinMarketCap cryptocurrency is complicit in unfair exchanges, overestimating their performance in trading volume, to help them attract new users. At an internal meeting held recently, Deputy Chairman of the people’s Bank of China (PBOC) pan Gunsan voiced the position of the regulator in relation to the ICO promoted in China by foreign companies. The official, who is also the head of the Leading group on addressing the risks in the field of Internet Finance, reiterated that the ICO is banned in the country, and those companies that do not comply with this prohibition and violate the law. His group was created in April 2016 and is the body that initiated the tightening of regulation of the cryptocurrency industry in the country. The meeting was attended by representatives of the people’s Bank of China, financial policy Committee, the municipal government and the above-mentioned working group. The official report States that the Central Committee of the CPC and the Chinese State Council attach great importance to combating the risks associated with Internet Finance. To play an active role in increasing access to financial services. «Financial activity must be licensed. Must be clear capital requirements, the qualifications of shareholders, employees, senior management and corporate governance», – said Gunsan. We will remind, in December the p’an Gunsan stated that the imposition of restrictions on the cryptocurrency market was the right decision, but to observe the collapse of bitcoin better “with the river”. According to official data, from September 2017, the share of world trade in bitcoin in pairs with the yuan fell below 1%. Before the introduction of the ban on ICO and centralized cryptologon in China, the figure was 90%. Team Bitcoin Gold announced the implementation SIGHASH_FORK_ID, which provides protection against re-play of transactions. According to the developers, SIGHASH_FORK_ID is a two-way protection mechanism. This solution introduces a new algorithm, which computes a hash of the transaction, so that all new Bitcoin transaction will be invalid in the blockchain of Bitcoin to Gold and Vice versa. The project team also reported on the readiness of the Bitcoin Gold for public testing. Its launch is planned «soon». Recall that hardwork Bitcoin Gold was held on 24 October. The bitcoin blockchain has been made on the block 491407. According to the road map project, a network was to be launched 1 November. However, this did not happen. Apparently, the launch date has been postponed to a later date. It would seem that what we have to fear, within just 2018 watching such swings? But on Friday, December 7, bitcoin gave us another blow, falling in the price of 84,28% compared to a historical high. 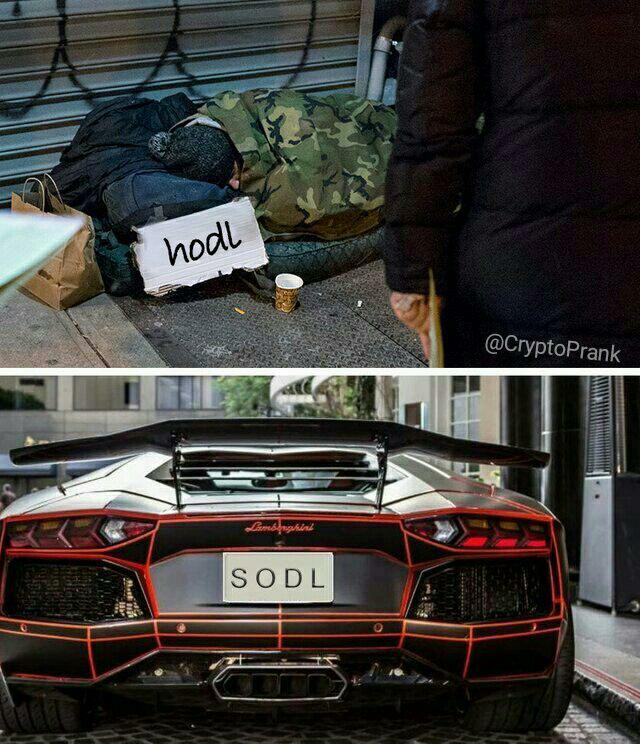 …and on the same day, the market of altcoins declined by 90% since the beginning of the year. The rule that «if an asset has four legs — it is more sustainable» didn’t work! How do you severe restrictions in food, captainvalor? «There is a positive side — I’ve always wanted to try fasting». 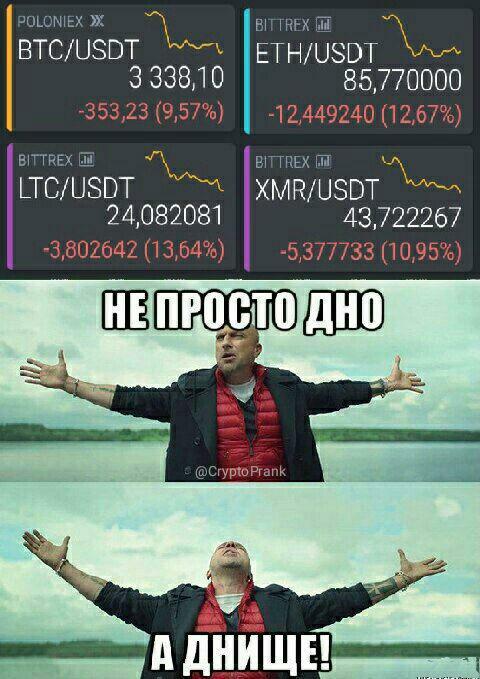 But how to decide on the exit from the market? 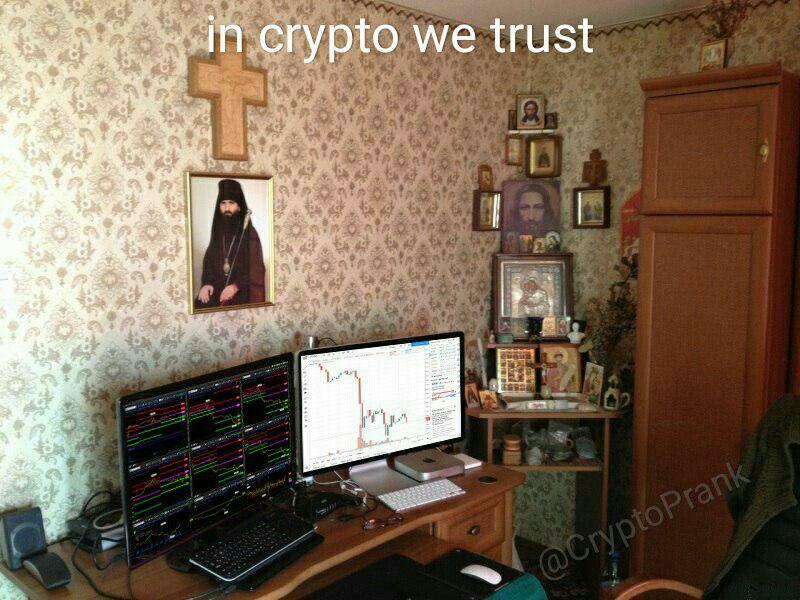 In this strategy we look like madmen, but the keys to the wallets, we do not take away! The approach of Christmas gives an excellent occasion for blackmail Santa) Well, who what of the dragon? 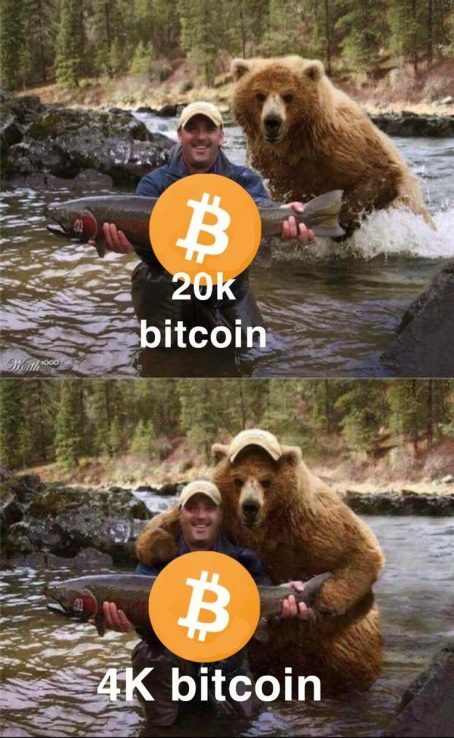 Don’t miss new memes in a week — be in touch with ForkLog in the cart! The Governor of the Kaliningrad region Anton Alikhanov said that in the next two years in the region will be mining valley. The area government carries on negotiations with potential investors, he said, talking to reporters on IPQuorum-2018. “We are negotiating with potential investors on the establishment of a number of our power stations of a certain mining valley. With Sberbank and Spartakom we are quite advanced negotiations on establishing a data center near to these stations. And of course, mining the subject must continue to implement,” — said the Governor. According to him, it is about a large mining valley, which appears in the region in the next two years. The authorities of the region there is a draft data Center, and they are waiting for proposals from business, said the chief Executive officer. We will remind, earlier Vice-Premier of the regional government Alexander Shenderyuk-Zhidkov claimed that the miners in the region provide the opportunity to become residents of a special economic zone (SEZ) for IT business.